Imperial-Deltah, based in East Providence, Rhode Island, was formed in 1995 following a merger of two well-respected companies engaged in the pearl jewelry industry. Its history can be traced back to 1892, when M.J. Karpeles established Deltah, the nation's oldest firm specializing in fine cultured pearl jewelry. Deltah, which later expanded into manufacturing simulated pearls, was purchased by L. Heller at the turn of the century. Heller later merged with Sperry Corp. in the 1950's. The new firm, Heller-Sperry, sold Deltah to Tevia, Gilbert and Elliot Sachs in the 1960's, who renamed it Pearls by Deltah. Banice Bazar and his Bazar Inc. purchased Pearls by Deltah in 1971. Imperial was founded by Joseph Gladstone in 1917, later renamed the Imperial Pearl Syndicate in 1941. It was during the post-war period that Imperial became the first to bring the valued Akoya pearls to the United States from Japan. A unique marketing campaign helped to establish brand recognition throughout the 1940's and 1950's. Both Imperial and Deltah pearls were marketed in ads featuring some of America's most notable theatre icons, including Elizabeth Taylor, Shirley Temple, Loretta Young. Gladstone sold the company to Sidney Weiss in 1969, who then sold it to the Waltham Watch Company in 1971. During Waltham's ownership, Imperial virtually abandoned its cultured pearl business and diversified into simulated pearls and gold-filled jewelry. Under the leadership of Banice Bazar, whose Bazar Inc. purchased Imperial in 1977, the company's leadership role in the cultured pearl market was reestablished, as the demand for both cultured and simulated pearls boomed during the following decade. The Bazar Group also includes Giovanni Jewelry. Founded in 1959, Giovanni's jewelry manufacturing business was originally based in nearby Providence, Rhode Island. 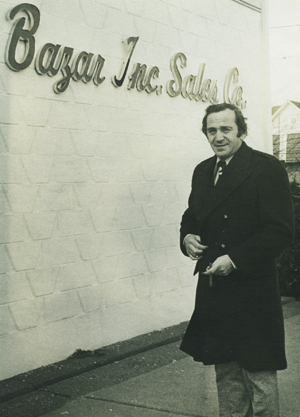 Bazar acquired the firm in 1973 and its operations have since relocated to the main East Providence, Rhode Island facility where Imperial-Deltah is based. Giovanni is an importer of costume jewelry. On June 1, 1995, Imperial Pearl Syndicate and Pearls by Deltah were merged to form Imperial-Deltah, Inc. The merger created a company that is now one of the world's leading pearl companies servicing a broad-based clientele, including department stores, volume jewelry retailers, independent jewelry firms, television networks, Internet retailers, wholesale clubs, recognition companies, and military exchange services. With a state-of-the art manufacturing facility in Rhode Island and China, the Company prides itself on superior product design and customer service, offering Tahitian, Chinese freshwater, South Seas, and Akoya pearls.